You’ve been seriously injured in an accident. You’ve done some research. And now, you know you need to find the best personal injury lawyer. It’s important to point out now – before you hire an injury lawyer – that you only get one chance to resolve your case. Settling for the first average personal injury attorney you contact could cost you thousands of dollars. Not only are you recovering from your injuries now, but you are in a particularly vulnerable place emotionally. There’s going to be a huge adjustment period. You’ll be missing time from work. There will be a great deal of uncertainty about your medical expenses and your future. Meanwhile, you have insurance adjusters trying to pump you for information concerning your injuries, medical facilities sending you bills and personal injury attorneys vying for your case. Finding the best personal injury lawyer for your case is a very daunting task. You probably have never had to even think about personal injury lawyers (other than maybe chuckle at their cheesy late-night commercials and "in-your-face" billboards), let alone find the best one for your accident case. A big part of our purpose at Sally Morin Personal Injury Lawyers is to educate those who have been injured in traffic accidents and help them navigate the process before they hire an attorney. 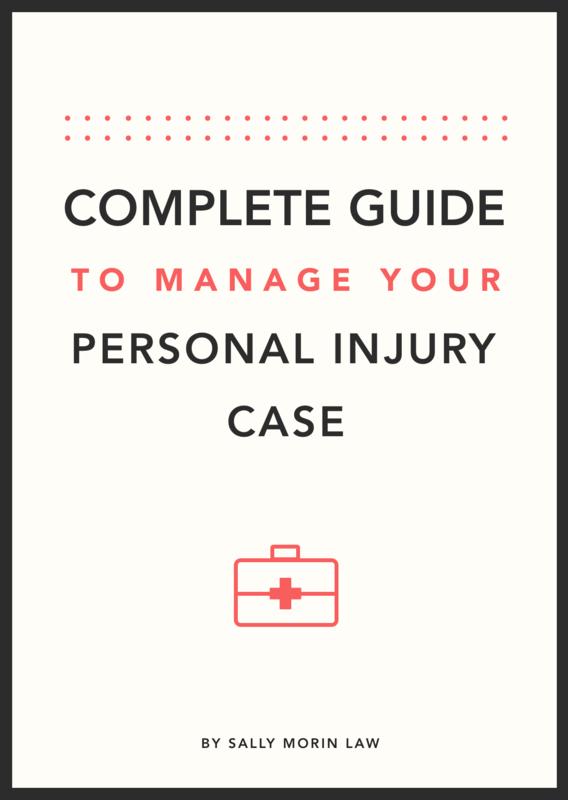 Here, we will walk you through how to choose the best personal injury lawyer. You may want to also check our list of the best questions to as a personal injury lawyer before you hire one, or our list of the top qualities to look for in a personal injury attorney to make sure you know what to look for in your search for the best. When figuring out how to find and hire a great personal injury lawyer, you want to look for someone who can guide you through the process of negotiating for a settlement and, if need be, the litigation process. You don't want someone who is just going to tell you what to do. Too Much Pressure. They felt like they were being pressured to settle for much less than reasonable. No Connection. They felt as though their attorney was distant or unapproachable. Non-Responsive. They had difficulty contacting their attorney. Dragging on. They felt the process was taking too long. So how do you, as an injured party, navigate the process of hiring the right lawyer the first time? Well, this page is dedicated to answering the question: how to find the best personal injury lawyer. When looking for the absolute best personal injury attorney for you and your case there are a handful of important factors you must consider to make the right choice. There are a ton of lawyers (about 9,000 in California alone.) Because there are so many areas of the law that lawyers can practice, the number of lawyers is astonishing. The various areas of law range from corporate law, criminal law, estate planning, family law to patent law… the list goes on and on. Most attorneys hone in on one of these types of law, but often you will find attorneys and law firms that cast a wide net and practice many of these types of law. In fact, there are even attorneys or law firms who will take just about any type of case that comes in the door, whether it be a divorce, business dispute, writing a will, or handling a personal injury case. This brings to mind the phrase “Jack of all trades. Master of none.” Personal injury cases are not rocket science, but they are also no walk in the park. You need a focused personal injury expert to lead the way. So, even if you've located a "personal injury lawyer" you want to be sure they are focused on your particular type of personal injury matter. Personal injury law itself can be very broad. You have personal injury firms that handle all sorts of injury cases like slip and fall cases, dangerous property cases, work injuries, assault cases, discrimination and harassment cases, employment cases, product liability cases, elder abuse cases, medical malpractice, airplane and helicopter cases and traffic accidents. They are all over the place! Even though they are labeled as “personal injury lawyers,” they have not honed their practice to only one or a few specific areas of personal injury law. In other words, these injury law firms are taking any kind of personal injury case you can imagine. That might be okay if they have the manpower to devote to every client. But, more often than not they prioritize their cases based on what they believe will be the largest payout, or which cases they are most familiar with. Then they work their way down from there. If your case is not their primary area of expertise, it will likely end up at the bottom of the pile. You want a personal injury attorney who works day in and day out on your particular type of case. That way, she will be up to date on the latest developments in that area of the law, the procedures to follow and the cutting edge resources available to strengthen your case. For instance, if you are in a motorcycle crash, you want an injury lawyer who knows the in’s and out’s of the motorcycle accident insurance system, has experience with litigating motorcycle cases in the courts and works only with clients who have been seriously injured. Choose an attorney who really hones her practice on the particular type of personal injury law involved in your case. We’ve established that a good personal injury lawyer will be an expert in a certain kind of personal injury law. The question then becomes: what separates a great personal injury attorney from a good one? The answer is reputation and referrals. A Lawyer's Reputation and Referrals Matter - Big Time! We all want to work with people and businesses that we know and trust, and that have a good track record for outstanding customer service and solid results. Ideally, we also get to work with people and businesses who our friends know or at least who "friends of friends" know and have happily worked with. These same desires for a good reputation and a qualified referral apply if you are searching for the best personal injury attorney to help you with your pedestrian, bicycle, motorcycle, Uber or car accident case. You want to dig into any potential lawyer online and see what their clients are saying about them. Are they reliable? Do they communicate well? How is their customer service? Do they get good results? Do they work efficiently? Read the reviews. The details of the reviews tell you a lot, not just the star rating. It is now pretty easy to learn about an attorney’s reputation by doing a quick search online. Various checks such as going directly to that attorney’s website, doing a Google search, watching some YouTube videos or browsing Facebook, Google+ and Yelp can quickly tell you a lot about how the attorney operates and what their clients think about them. Make sure you look around and find out what people have to say about any personal injury lawyer you are considering. If there are issues or problems with that attorney, they are sure to turn up somewhere online. The same goes if they are great at what they do and get good results for their clients. These things will quickly be apparent if you do your research. Also, with the ubiquity of social media (Facebook, Google+, Yelp, Next Door, etc. ), it is much easier than in the old days to find an attorney that is recommended or referred by someone in our circles, or at least someone who has had real experience with that lawyer. Take the time to reach out to your circles and find out who the people you love and trust (or at least those whose social media posts inspire or entertain you) would recommend as the best personal injury lawyer for your accident. Another thing to seriously consider when looking for the best personal injury attorney is the “source” of the information upon which you are basing your hiring decision. Does it come from an independent third party? Is it from paid advertising? Is it from the lawyer himself? Or, is it from someone who stands nothing to gain (except the joy of giving a recommendation of great service to others)? In the dark ages, the most successful (not the best) attorneys simply posted huge ads in the phone book or on buses or billboards to lure in clients. Now, you do not have to get caught in that net. You can be proactive, do some research and find out valuable information (that is not paid advertising) about the attorney you plan to hire to help you make that decision. BUT, be sure you don't get caught in the new trap of falling for "online puffery" created by the lawyer (or his marketing team) himself. Be warned! There are various attorney “rating” sites that reward attorneys who pay for listings. Just because a lawyer has a fancy "Awesome Lawyer" badge on their website, doesn't mean they are actually awesome. They may have just paid for the badge. It is important to know that the attorney you are considering has provided former clients with positive experiences and that those former clients, if they had to, would choose that same attorney again. Make sure to ask for referrals (or look for reviews online) and check out the reputation of any attorney you are considering to handle your personal injury case. Ok, get out there and do your research to find the best personal injury attorney for your accident! As we mentioned above, you want to dig into any potential personal injury lawyer's reputation, by checking for reviews and referrals that go into detail about how that lawyer or law firm works. You also want to ensure they get solid financial results for their clients. An attorney that doesn’t have the results to back up their experience will not be a good choice to invest your case in, and it is an investment. Great attorneys have a track record of successfully settling cases, litigating them if they have to, and have trial experience when necessary to ensure their clients get the best possible outcome. As mentioned above, be sure to check out what former clients have to say about the results achieved by any attorney you might hire. If you’re wondering how to find the best personal injury lawyer, the great ones have a track record of success. This doesn’t necessarily mean they only achieve multi-million dollar settlements. It means that they achieve solid and fair results based upon the particular circumstances of the case. It also means that they get great results on all of their cases, not just the big ones they brag about. So, just because a lawyer advertises that's he's won several multi-million dollar verdicts, that doesn't necessarily mean he'll do a great job on your $50,000 or even $250,000 case. He may be more focused on his multi-million dollar cases to give yours much time or effort. You might want to do a little research into what the average personal injury settlement is for cases similar to yours before you get too pumped about hiring the "multi-million dollar verdict law firm." You probably want to look more closely at the results for cases that resemble yours, rather than the enticing, big-money results. For instance, if you broke your collarbone in a motorcycle accident, it doesn’t really make sense for you to hire a lawyer based upon an impressive 5 million dollar settlement they got for a child injured by a defective car seat. Do they have any results for cases and injuries similar to yours? Check those out. Good personal injury attorneys specialize in your kind of injury case. Great personal injury attorneys have a track record of winning verdicts and excellent settlements. But what qualities do the best personal injury attorneys have? Who wants to work with someone that forgets about you? Or a large company that looks at your business as just another dollar? Nobody. The same goes when you hire a personal injury attorney. You want to hire a lawyer who is interested in you and your case. Not a lawyer who is desperate for your case, but one who shows a general interest in you and your situation. And, has the time and resources to give you and your case the attention it deserves. If a lawyer and his team seem totally uninterested in you or your case (except for the fee it will produce), and it feels like he is just adding your case to his enormous caseload, chances are you won’t get the attention you and your case deserve. There are a lot of "high-volume" personal injury law firms (specifically the ones who advertise on TV and/or billboards) who get 100's of calls a day and take on way too many cases each month. Don't be one of many. Do your best to find an attorney who expresses a reasonable level of genuine interest in you and your case. It’s important to recognize that while attorneys operate their law firms for profit and as a business, not all law firms are cut from the same cloth. To find a great personal injury lawyer you want to find one who, although they are making a living, prioritizes people over dollars. Your Personal Injury Lawyer Must Be "Local"
All lawyers are only permitted to practice law in the state or states in which they hold a license by that State's Bar. So, you want to be sure you are hiring a personal injury lawyer who practices in the state, and even locale, where you were injured. So for instance, even if you are a resident of one state, but you were injured as a tourist or on a business trip in another state, you need to find a personal injury lawyer in the state where you were injured. To find the best personal injury lawyer for you, look for a "local." Now that you know how to find good, great and the best personal injury attorneys, we’re going to talk a little bit about how to hire a BAD personal injury lawyer. Some lawyers get into personal injury law because they believe it is a lucrative area of practice. That’s not intrinsically bad, but there are over 9000 personal injury attorneys in the State of California alone -- with a large percentage of those being located in or around the Los Angeles and San Francisco Bay areas. In other words, it’s a highly competitive area of practice. Personal injury attorneys vie for cases and employ certain strategies to draw in clients. These strategies are not always ethical and they do not always have their client’s best interests at heart. You’ve just been in a serious accident and the vultures are circling. It is as bad as you calling your loved ones from the hospital to tell them what happened and an ad pops up about a personal injury law firm. My God, you think, how did they even know about my accident? (There are apps that allow lawyers to target ads based upon your GPS location.) Or, after you are released from the hospital and are on your way home you see a huge billboard saying "INJURED? Call 1-800-LAWYER!" Or, you are on the couch recovering from your injuries and a cheesy commercial shows someone whose lawyer "got me millions" for a personal injury case. These are all really passive ways for you to find a personal injury lawyer, and chances are you'll find a bad one this way. Some injury law firms use ad agencies and apps that can target people in emergency rooms and advertise to them in their most vulnerable time. And, good ole billboards are just a wide net cast by law firms that don’t really care who they serve. TV commercials are another way for injury lawyers to keep their high-volume, low-quality service going. There are various attorney “rating” sites that reward attorneys who pay for listings. These aren't real client reviews or testimonials, they are paid advertising. Lawyers that use these tools typically have a business model that is based on taking as many cases as they can and settling them as quickly as possible, taking a cut, and moving on to the next case (or hundreds of cases.) In most instances, an individual who decides to go this route could likely be better off simply taking whatever the insurance company’s first offer is. At least then they wouldn’t have to fork over a portion of their settlement to a lawyer that never touched their case, because they had a legal assistant handle it. Avoid the above tactics, unless you are looking to hire a bad personal injury lawyer. If you want the best, you need to be proactive in finding a great personal injury attorney. As discussed above, it's very important that your lawyer be interested in you and your case, so that you get the proper attention you deserve. Although you want an attorney who is enthusiastic about representing you, you don't want one who is so enthusiastic that he is urging you to retain him before he has even gotten any details about your case. If you sense at all that the attorney is desperate, there may be a reason for this. Either he is struggling, has a bad reputation, is in a rush, or some other red flag. Ask questions, or simply move on to selecting another lawyer, if you sense any desperation from the attorney or his staff. Be sure you’ve done your research on this attorney’s reputation and found information that indicates she cares about her clients and their cases. Do the online reviews for this attorney indicate that her former clients felt taken care of? Or, is there anything to indicate that the client felt “small” or unimportant? The bottom line is that to avoid hiring a bad personal injury lawyer you want someone who is interested in, but not desperate for, your case. Personal injury attorneys have their own personal goals, and you have yours. The real question is: are those goals aligned? You first have to consider what your goal is in pursuing your personal injury case. Is your goal to take the other party for every cent they are worth? Is it to take the case to trial and have your day in court? Or, is it just to get a reasonable amount of money to compensate you for what you’ve gone through and get back to your life? Make sure your goals are aligned with the injury lawyer you hire... otherwise, you could be looking at trouble. Your goals (and that of the attorney) in the case will likely dictate the “style” of lawyer you want to hire. If you are out for blood, you want to hire a “rabid dog” of an attorney. Alternatively, if you want to collect what you reasonably deserve without going deep into litigation, you want to hire a more diplomatic and reasonable attorney. Or, if you are feeling overwhelmed by the process and all the paperwork, you want a lawyer who focuses on attentive customer service from start to finish. Make sure you research what people online have to say about any attorney you are considering to make sure his reported style meets your intended goal of the case. A personal injury lawyer’s style is not always indicative of his skills and vice versa. For instance, an attorney may have a good track record in the courtroom, but may be difficult to deal with, or may not approach things the way you would want. On the flip side, the attorney may be as sweet as pie and available 24/7, but may not be skilled in the area of law for which you need representation. You want to find the right balance for you. Ideally, it will be a great attorney who is pleasant to work with and makes you feel like you are a top priority, but will also fight hard when necessary to assert your rights in your case. Ensure that your attorney’s goals for the case (and his style) are in line with yours. If they are not, you might be facing a bad outcome in your case. Don’t let this happen. Do your research to find the best injury lawyer to match your objectives. Do your research on this! Check out what people online have to say about any attorney you might hire to make sure his reported style meets your intended goal for your case. You want to make sure that your attorney’s goals and style are in line with yours. If they are not, conflicts will arise later in the case. You could find yourself pushing for your lawyer to take the case up to the next level (litigation or trial) and he tells you he wants to bail from the case unless you settle. Or, you could end up with the attorney dragging you through a lengthy trial that you never wanted in the first place. Don’t fall into this trap. Research thoroughly to find the best personal injury lawyer in to handle your accident case. As you have probably heard many times, trust is the foundation of any good relationship. That includes your relationship with your personal injury attorney. A key factor to look for when you hire the best personal injury attorney is trust. The bottom line is that no attorney will be right for you unless you can trust them. There are a lot of people who think lawyers, in general, are sneaky or slimy. What’s even worse is that personal injury attorneys are often regarded even lower than other types of lawyers. They call us ambulance chasers and I’m pretty sure some people think we sit around emergency rooms just waiting for that perfect “victim” to come in… one who is just conscious enough to lift her hand to sign the fee agreement. Well, there still are some shady personal injury lawyers in the world (their tactics are mentioned above) but most of us are normal people who love working with clients to get them what they deserve. There are some personal injury attorneys out there that you can trust. You just need to find one. When looking to hire the best personal injury lawyer for your accident, you need one you can trust. Look for someone who is genuine in their message, speaks from the heart, has a good reputation in the community and someone you get a good feeling from when interacting with them and their staff. While the question of how to find the best personal injury attorney will not always yield the exact same answer, it’s important to trust your instincts when it comes to the process of hiring your lawyer. You want someone who focuses on your type of case, fits your style and is devoted to your case. You want someone you can trust during this stressful time. Someone who has your back! There’s so much uncertainty that clients in these sorts of cases face. Your should feel as though a burden is being lifted once your personal injury lawyer has taken over the case. Your lawyer should act as an intermediary between you and the insurance company and advocate on your behalf. That means taking all of the pressure off of you in dealing with the insurance companies, lawyers, police and witnesses and allowing you the opportunity to focus on your recovery stress-free and in peace. Avoid the run of the mill personal injury firms who take on “everything that comes in the door.” Choosing a personal injury law firm that has a focused and selective approach is best. Such firms can concentrate their skills, energy and resources to better serve their clients like you. Be sure to find a personal injury lawyer who has a similar style and the same objectives as you, and of course someone you can instinctively trust. At Sally Morin Personal Injury Lawyers, most of our clients are busy professionals and adventure seekers who don’t have time to worry about their cases. Our number one goal is to get a solid financial result for our clients so they can move on from the case and get back to their awesome lives! Contact us to see if we can help you. Click on the red button to get a FREE online case evaluation online 24/7 and hear back from us in less than 24 hours. Or, read more to see if our office is a good fit for you and your case. Learn more about how it works if you hire us.